And finally it was time to leave St. Martin and set sail for Virgin Gorda, port of entry for the British Virgin Islands. The passage is approximately 90 miles, and we leave in the early afternoon, so as to arrive after daylight. That means were in for one of the most sublime experiences that modern life still has to offer: a night passage. Since Helena and I have been on Fiona for a couple of days, we've both got our sea legs, but since it's blowing fairly hard when we leave, I take a Dramamine, just in case. I've never been seasick, and I'd like to keep it that way. The afternoon passes easily. Once off shore, we discover that the blue Caribbean Sea is hardly bothered by the constant blowing of the Trade Winds. Fiona rolls down towards Virgin Gorda doing a steady 5 knots. I find a good book. Helena works on her tan. The passage from St. Martin on the right, to the BVI on the left. But it's sunset that I'm looking forward to. As I've probably mentioned before, night sailing is my favorite thing. It would be hard to explain why, but the word 'romance' figures into it, heavily. As luck would have it, I draw the first watch. There's a full moon behind us, and after Eric heads off to his bunk, and Helena goes below to work on her blog, I have Fiona to myself. There isn't much to do: just stay awake, and watch for other boats. This leaves plenty of time for looking at the moon, picking out stars, and day dreaming. Unlike the busy coast of Brazil, there are no big ships, and very few small ones. But the moon is brilliant and I have no trouble staying awake. During my second watch, 8 hours later, the moon sets and Venus rises. With the moon gone, the Milky Way blazes overhead. I watch for shooting stars and count three before Eric relieves me, just before dawn. The night was too short. At Virgin Gorda, Fiona is back to her old tricks and we have a day of repairs. Eric's Japanese outboard isn't pumping water. To my surprise, I seem to know more about outboard lower units than Eric does. Hurrah! I knew this day would come, eventually! I spent a whole week, this spring, pulling the Blue Moon's outboard apart (did I blog about that? I don't think I did.) Who would have guessed it would pay such delicious dividends, so quickly? We pull the lower unit, take apart the water pump, and inspect the impeller. Oddly, it looks fine. So why isn't it pumping? After fiddling with it for a while, it suddenly strikes me that it's the wrong impeller. It's shape doesn't fit the drive shaft, and so it is not spinning when the drive shaft turns. How did it ever work? I have no idea. Eric quickly agrees, and we spend a few minutes cursing the outboard mechanic who was supposed to have serviced the outboard for a journey to the Antarctic. A rather irresponsible mechanic, I'd say. Yet another reason to do your own work. We brainstorm a kludge to adapt the impeller to the shaft, but when we re-assemble the outboard and give it a try, it doesn't work. We give up and drag the old Seagull out of the engine room. Eric has fixed the fuel line, so it doesn't leak as badly as it did in Brazil. But it's still an old Seagull. At last we putter ashore and go through the customs dance. I wonder why they bother? After checking in, we decide we're too tired to try for Anegada tonight as planned. Thank goodness. I'm bushed, and even Eric looks done in. We walk to the marina bar and sensibly have a beer and pizza, instead. And that, dear reader, is the cruising life. Sailing from one place to a destination is called a passage. I don’t know how long a sail has to be to qualify, but my guess would be overnight. While picking John’s and the Captain’s brain, we came up with several meanings for the word ‘passage’. Rite of passage, Passage to India (great movie), one’s passage to a different stage of life... I learned that a route between two islands is also called a passage. We arrived in Virgin Gorda at around 9:00am. Beautiful island with sandy beaches, and water the color of a shallow pool. We tied to a mooring (three attempts no less) with a lot of near misses, yelling, and frustration. Rope not wide enough to get through the mooring; not long enough… I don’t really know: just a lot of goings on. Finally, we are ready to go ashore to clear customs. This time we have to take the inflateable dingy. It is heavy. It has a motor attached to its stern, and we have to lift it, then push it over the lifelines, and outside of the shrouds, and lower it down to the water. 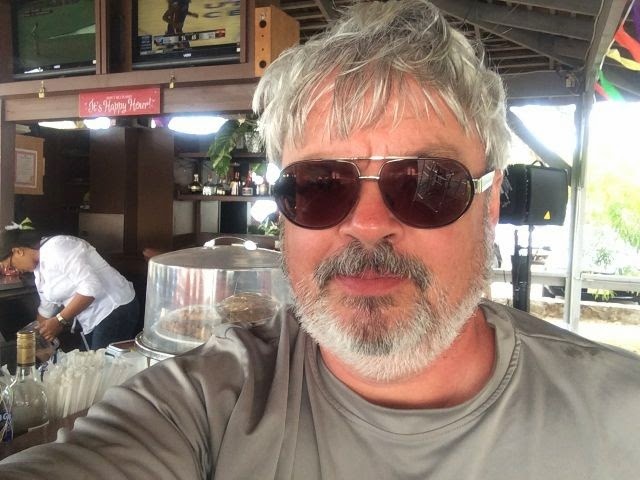 Hard work, but we have to do it so we can go ashore and clear customs, then sail on to Anegada to swim and have lunch. But then Eric discovers that the outboard is not working. Somehow the water is not coming out of the back as it is supposed to. We haul the dingy back onto the boat, sweating, swearing, huffing and puffing. Eric and John will spend the next 3 hours disassembling the motor, greasing, flushing, unscrewing, pulling, etc, etc….. They find the problem, all is well. We re-assemble the engine, lower the dingy back in the water. More pushing, grunting, heavy lifting, but it still doesn't work. No better than it was before. I guess now they do know what is wrong with it, but they cannot fix it. The mechanisms involved in lowering and lifting the dingy in and out of the Fiona are not simple. A wire has to be attached to the main something and then using a winch and metal cables it is lifted. 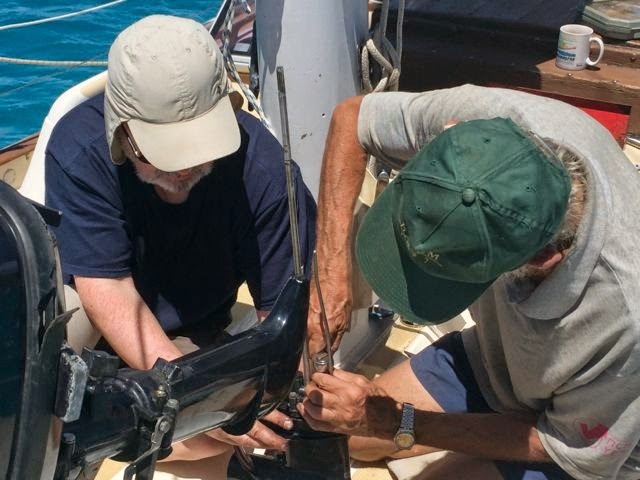 Then, while John is holding the cable in place, Eric and I have to clear the 150lb boat our of deck, pass the shrouds (metal wire cables), and pass the bolts and nuts of the side of the Fiona, and then to the water. To bring the boat back we have to reverse the operation. Bruises, scratches, blisters and blood clots are back. Ok, none of this worked. We had lunch and the captain decided we will change the engine on the dingy. John takes the old no-good engine out. They both carry an alternative engine out of the back of the boat. This little thing is leaking gas from the back of the boat to the front. We are slipping and sliding. Remove the old engine, in with the new old engine. OK, it works. Ready to go onshore? YES!!!! While we are having a quick bite, preparing to go ashore, an official power boat stops by and notifies us that we are using a private mooring and that the owners are 5 minutes away and that the customs will close in 20 minutes. Blast! We have to move the boat. 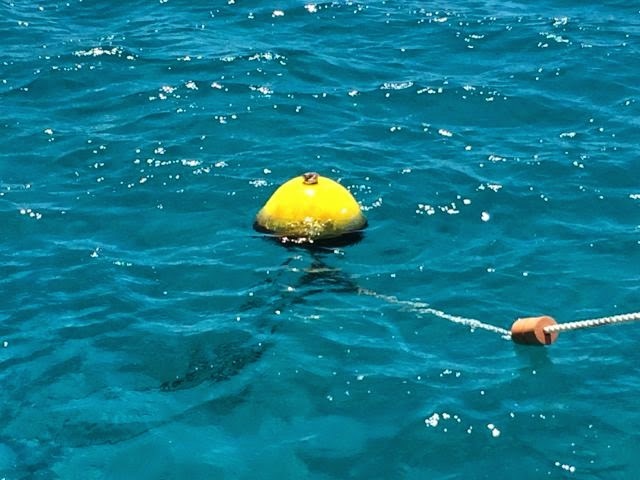 Undo mooring, try to find a place to anchor. 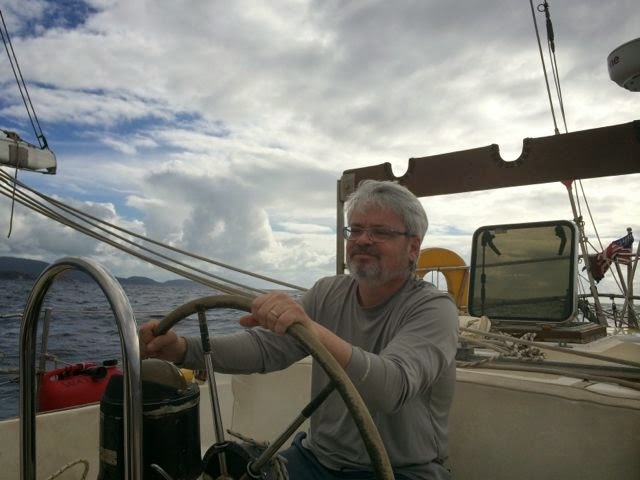 John is sitting by the anchor's dangerous windlass. He's dropping the chain manually, I am in the middle of the boat, relaying orders and answers between Eric and John. I am in the middle of the chain, in more than one way. Three attempts before the anchor is set. It is now 3:00 pm, seven hours after we arrived. We haven’t accomplished much. By the time we get to customs, we are all silent and wishing a stiff drink. After clearing the port, we find a little bar where we order a couple of drinks and pizza. One man who earned his beer and pizza today. I am tired, a bit sunburned, dehydrated and a little frustrated. John and Eric are sleeping. I am joining them soon. 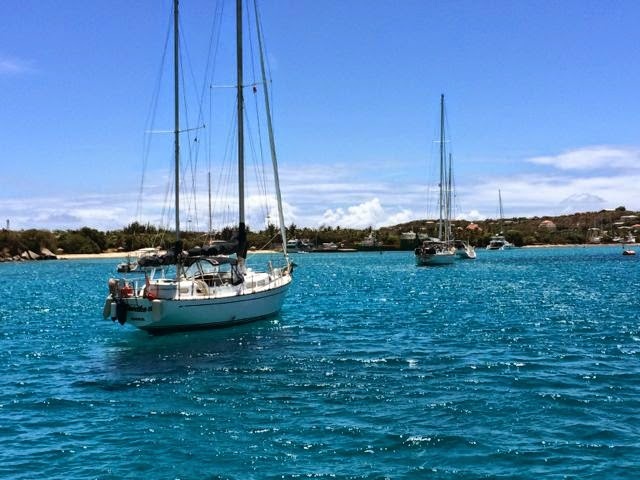 Tomorrow we sail for Anegada.